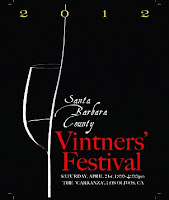 Some of my favorite wines in the world come from Santa Barbara County. 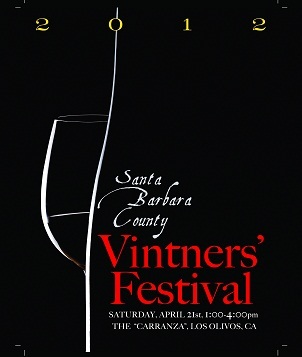 So you can imagine my delight when I received the notification that the Santa Barbara County Vintners' Association annual celebration of spring, the Vintners' Festival was scheduled for April 21st at a new venue called The Carranza on Zaca Station Road. We drove up Saturday morning. It was cool and foggy along the coast, but when we emerged from the Gaviota tunnel, we knew we were in for a scorcher. After a hearty breakfast at Mother Hubbard's in Buellton, we headed to The Carranza. It was already almost 90 degrees when we arrived at noon. We were happy to get in early with the media, and immediately discovered there were significant problems with the venue. It was a cow pasture. Recently - or possibly currently - used. The ground was severely rutted, full of gopher holes and cow patties. We literally couldn't take our eyes off the ground, as one false step would have sent us tumbling. The winery tents were set around the field so far apart from each other that it was exhausting trying to get from one side of the event to the other. I can't imagine how some women in heels managed to get around the event. We stopped briefly at Riverbench Vineyard to taste their delicious Chardonnay, and moved on to Roblar Winery's delightful Sauvignon Blanc. We climbed to the far side of the event, tasting white wines and rosés because it was too hot to taste reds. We chatted briefly with winemaker John Dragonette (and waved at winemaker Brandon Sparks-Gillis) of Dragonette Cellars, while getting our picture taken by local photog, Bob Dickey (no relation). It was great to chat with Flying Goat Cellars winemaker Norm Yost while tasting his lovely Goat Bubbles sparkling wine. 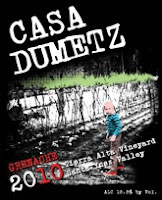 This incarnation was a Crémant made from Pinot Blanc from the Sierra Madre vineyard. Refreshing and delicious. We made the acquaintance of some new winemakers: Harrison Clarke Vineyards & Wines' Hilarie Clarke Harrison with a lovely Sorellina Grenache Rosé, and Coghlan Vineyard & Jewelers' (yes, you read that right!) Eric and Samantha Coghlan - the wine was delish and the jewelry worn by Samantha was gorgeous! We chatted briefly with Jenny Doré at Foxen Vineyard before moving down the side of the tent to meet winemaker Blair Fox whose wines we have loved for several years. After refreshing ourselves with his icy cold not-yet-released Rosé, we moved on to good friend Karen Steinwachs of Buttonwood Farm and her always delightful 'Zingy' Sauvignon Blanc. Fighting our way thru the crowd to Tercero Wines, winemaker Larry Schaffer pulled his newest wines from under the table for me. At this point, I felt my insides start to shake and I got HOT. Hot and shaky. I said to JD, " I need water right now and I need to sit down." We hiked to the center of the field to get bottles of water being handed out by the CA Highway Patrol, and continued over to the other side of the event, where volunteer Juanita, who was pouring for Peter Cargasacchi's Point Concepción wines, took one look at me, pulled ice out of the cooler and sat me down on the selfsame cooler, where I drank ice water in the shade. That was pretty much the end of the event for us. After recovering enough to move again, we chatted with Nan Helgeland of Martian Ranch & Vineyard, introduced ourselves to Mikael Sigouin of Kaena Wine Company (good friend and consultant to our own Shawn Shai Halahmy), limped out to the car and cranked the A/C. I'm only sorry that we weren't able to visit more tables and taste some of the restaurant offerings. Maybe next year. And maybe next year, the SBCVA will have improved or changed the venue. We headed a few minutes north to Los Alamos, where I took a cold sponge bath in the rest room at Casa Dumetz. We sat in the charming tasting room, cooling off, tasting winemaker Sonja Magdevski's lovely offerings, and stayed for the "Not Your Mother's Grilled Cheese" event being co-hosted by Bedford Winery, another favorite of ours. The day cooled off, the food was delish, the company delightful, killer blues played by "The Stupifiers," a rocking band, and we all felt better. When I went to say goodbye and thanks to Sonja, her fiancé, Emilio Estevez, was there. We had met once before at a LearnAboutWine tasting in Malibu, and I was gratified that he remembered the meeting in great detail! I was also glad to be able to tell him how moved I was by his movie, The Way, which I had recently seen. We headed back to Buellton, washed up and changed into clean clothing, headed to Solvang and the amazing Root 246 restaurant, met up with Mark Newman, the Million-Dollar-Palate himself, and hung out in the bar cleansing our palate with Macallan 12 until it was time to hit the hay. Sunday dawned cloudy, but cleared up for a cooler, more pleasant day. 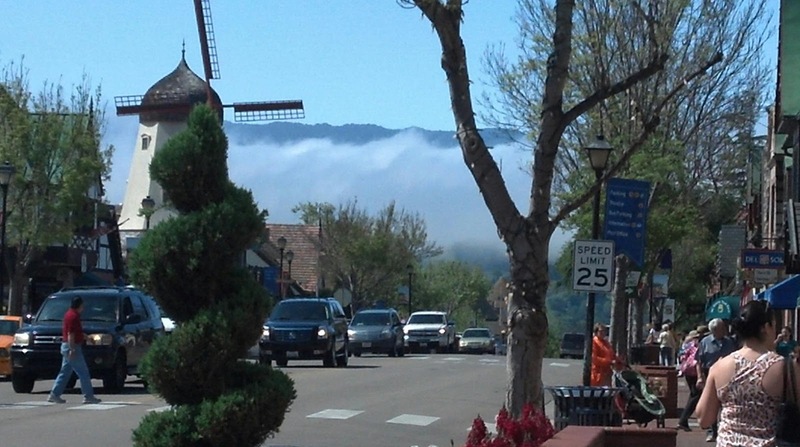 We walked around Solvang for an hour just to get some exercise, breakfasted at the Belgian Café and headed west to Lompoc, where we tracked down the wily Peter Cargasacchi, grape grower, winemaker and master of social improv. Using estate fruit, Peter and his wife, Julia, produce two Pinot Noirs under the Cargasacchi label and one late harvest Pinot Grigio. They also produce Pinot Noir, Chardonnay, Pinot Grigio and Syrah under the Point Concepción label from estate and purchased fruit. We tasted our way thru his current lineup, chose a few bottles to take home, and headed off in search of more wines to taste. 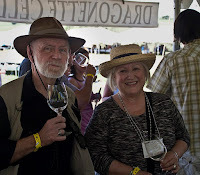 A brief stop at Taste of Santa Rita Hills provided a delightful surprise. Owner and winemaker Antonio Moretti poured his own wines, as well as hosting Deborah Hall of Gypsy Canyon Winery and Graner and Bobbie Thorne of Thorne Wine. We took a bottle of the 2010 Moretti Bianchetto, a blend of Tocai Friulano, Arneis and Malvasia Blanca, and a bottle of Thorne 2009 Pinot Noir. We decided to finish our weekend at Cold Heaven Cellars in Buellton. Morgan Clendenen, in our opinion, makes the Viognier by which we measure all the others. And her Pinot Noir and Syrah rocks our world, too. We spent much longer there than we planned, made some new friends, drank some great wine, ate some great food, and hit the road thinking we'd get home early. On the 101, the phone rang and it was our favorite stalker...I mean...winemaker, Shawn Shai Halahmy! He was traveling north on the 405 from the South Bay, and we were in Oxnard. We were all hungry, so we met halfway in between - at Fab's, our home away from home. This was good, as it gave me a chance to fine-tune the details for my class on May 12th. Hope you'll join us as we discuss the differences between Old World and New World wines! Home at last and on to the next event! Cheers! Hey Kerin! Thanks for your kind words. We really enjoyed our time with you and Chris, and hope to have the opportunity to share some wine with you again. Cheers!